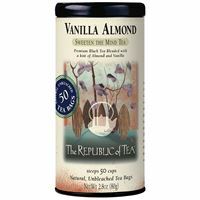 Vanilla Almond from The Republic of Tea. I first had this at the Borders book store in Madison, WI and I’ve never turned back. It got me through cold Madison winters and the long days of “studying” at the book store (which really meant reading all of the magazines and sipping tea with some breaks for studying). Wild Sweet Orange from Tazo. This tea will brighten any bad mood. It always makes me happy. Throat Coat from Traditional Medicinals. This tea is ridiculous! Every sore throat (or wanna be sore throat) I have is instantly gone after drinking this tea. Chai tea. This tea has been reintroduced into my weekly routine. I find it helps my creativity, so on late nights working on my posts, I’ll drink Chai–even decaf– and I’m ready to go! Funny, now my daughter likes it–so I have a four year old asking for Chai tea. How cute! I almost forgot Earl Grey! (I’m drinking it now as I’m typing this). A former econ professor introduced me to Mr. Grey and I’ve hardly strayed. The title sounds so stuffy, but once you smell the orange bergamot (it’s in many perfumes) you won’t be sorry. The added caffeine (it’s a black tea) is a nice pick-me-up for cold and dark fall/winter mornings.